Al-Shabaab (known officially as Harakat al-Shabaab al-Mujahideen [HSM]) is currently conducting a terrorist campaign against Kenya. This terror campaign is facilitated and made possible by existing internal and external dynamics which enable the terror group to foment a security crisis in the nation. These dynamics are concisely described hereafter. 1. Geo-strategic Location and External Interference. Al-Shabaab maintains its operational and command-and-control bases in Somalia, and Kenya’s proximity to the unstable nation coupled with its porous Kenya-Somalia border allows terrorists to infiltrate the country and also establish patrol bases from where they can conduct attacks on Kenyans as well as destroy the national infrastructure. Presently, Kenya is the political, military and economic powerhouse of East and Central Africa (excluding Ethiopia); and its vanguard role in the war on terror makes the nation a suitable target for terrorists. Al-Shabaab understands that crippling the economic lifeline of Kenya as well as destabilizing its frontier regions would significantly dent the current counter-terrorism campaign in Somalia, thus ensuring the survival of their terrorist insurgency. Furthermore, Kenya’s location as the gateway into East and Central Africa has tempted external powers and interested foreign parties to attempt to subvert the nation besides sabotaging its national economy. Some of these powers, especially Gulf Arab Nations such as Qatar have propped up HSM to serve as their proxy. Sudan is also a suspect as the real forces and operatives of NIF (National Islamic Front) seek to subvert land-locked South Sudan by denying it access to a trade infrastructure which is currently wholly dependent on Kenya. Moreover, Sudan has an interest in seeing South Sudan unable to transport its oil through Kenya (via Mombasa) and onto the international market. Al-Muhajiroun, also known as the Emigrants of East Africa, is Al-Qaeda’s official affiliate in the East African region. It was created in January 2015 as a dedicated terror outfit that would integrate both Ansar al Mujahideen and Al Hijra (formerly MYC) elements into a distinct, cohesive and unified militant group, so as to reduce operational overhead costs as well as ensure efficiency of terror operations by eliminating unnecessary inter-group conflicts, reduce instances of duplication of tasks, in addition to creating a clear chain of command (which would ensure that the group does not suffer internal wrangles such as those suffered by Al Shabaab). Presently, its focus of operations appears to be Kenya with the other East African nations suffering sporadic attacks. The reason for this disparity is that a majority of al Muhajiroun members are of Kenyan origin and are quite familiar with both the political and security dynamics of the nation. Al-Muhajiroun is subordinated to al-Shabaab, but one of its senior leaders, Abu Salim al-Kenyi (the nom de guerre being used by Ahmad Iman Ali – another senior al Qaeda-affiliated terrorist of Kenyan origin) has stated that they recognize Ayman Al Zawahiri – al-Qaeda’s de facto leader - as their Supreme Leader. They do publish an online magazine known as Amka. Al-Shabaab has vowed to conduct a series of “earth-shaking” and “devastating” terrorist attacks in Kenya very soon. The vows were made by the Emir of al-Shabaab, Ahmad Umar (alias Abu Ubaidah); Chief of Amniyaat, Mahad Karate; and the Emir of Al-Muhajiroun (Emigrants of East Africa), Sheikh Izzedeen al Tanzani. The pledges were made as al-Shabaab adopted a policy of calculated neutrality with regards to both Al-Qaeda and ISIS (Islamic State in Iraq and Syria). At the moment, al-Shabaab is firmly within the al-Qaeda fold but it has established operational networks with ISIS-affiliated terror groups across Africa, the Middle East, South-East Asia and Europe. Kenyan Engineers Develop Better and More Powerful IEDs. This is the final installment of a four-part series analyzing al-Shabaab psychological operations (PSYOPs) in Kenya, and how political process in Kenya aids al-Shabaab to achieve some of its strategic objectives. Infamous al-Shabaab attacks in Kenya accompanied by equally infamous and bungled government counter-terrorism operations (including attempts to end hostage-sieges) have enkindled popular discontent against the Jubilee government (the Kenyan government is dominated by members of the Jubilee Coalition) as well as lend credence to the opposition’s (dominated by CORD [Coalition of Reform and Democracy]) mantra that KDF (Kenya Defence Forces) should be withdrawn from the Somalia (the Cradle and Home base of al-Shabaab). KDF Withdrawal from Somalia. But Why? This is the third installment of a four-part series analyzing al-Shabaab psychological operations (PSYOPs) in Kenya, and how Kenya’s entanglement in Somalia toxic clan politics have enabled al-Shabaab to achieve some of its strategic objectives. Kenya entered Somalia with the stated objective of expelling al-Shabaab from the nation as well as pacifying Somalia. Unable to expel al-Shabaab, the Kenyan government settled for capturing Kismayo – the most important Port city in Southern Somalia. KDF (Kenya Defence Forces) captured Kismayo and proceeded to entrench itself in the chronic and malignant Somalia clan politics. The meddling of Kenya in Somalia clan politics thus exposed another facet of KDF operations in Somalia – the creation of a semi-autonomous Ogadeni-dominated State in Southern Somalia. The state was christened Jubbaland (after the clan leaders expressed their misgivings of the name Azania); and it abuts the Kenya-Somalia border in its entirety. This is the second installment of a four-part series analyzing al-Shabaab psychological operations (PSYOPs) in Kenya and how its modest success have advanced the ideals of Islamic Chauvinism in the region. Part 1, Part 3, Part 4. Cleansing Somali-Dominated Regions of Non-Muslims – Overture for Reversion to Clan Warfare. Al-Shabaab aims to induce (and sometime reinforce) actions and behaviours that are favourable to its strategic objectives. By attacking a College in Garissa, and selectively murdering Christian students (all of them hailing from outside the region); al-Shabaab was able to induce fear among the non-Muslim population in the region, and consequently most of the Christian inhabitants of Garissa have left or contemplating to leave the region (all the surviving non-Muslim students have already left, and have sworn not to return to Garissa). This is the first installment of a four-part series analyzing al-Shabaab psychological operations (PSYOPs) in Kenya and how the modest success of its PSYOPs combined with its strategy of integrated terror have enabled it achieve some of its strategic objectives. Part 2, Part 3, Part 4. On April 1st 2015, President Uhuru Kenyatta of Kenya lambasted the US, UK and Australian governments along with several other European governments for issuing travel advisories against Kenya. The advisories have contributed majorly to the near-collapse of the Kenyan tourism sector. Kenyatta asserted that Kenya was safe for tourists and even encouraged tourists from African nations to holiday in Kenya in order to defiantly show its traditional tourist markets that Kenya can withstand their travel advisories. Less than 24 hours later, members of the Salafist Takfiri Jihadist organization, al-Shabaab, stormed into Garissa University College and massacred over 140 students during the ensuing hostage-siege. The hostage-siege crisis ended approximately 12 hours later, but the psychological blow was dumbfounding, and its effects still linger to this day within the collective will of Kenyans as exemplified by a series of events that occurred after the ill-fated Garissa University College attack. Al-Shabaab terrorists ambushed a KDF (Kenya Defence Forces) convoy in the morning hours of 6th May 2015. The ambush occurred at a Somalia village located near the Kenyan border town of Liboi. The ambush was repelled and the terrorists dispersed. Casualty figures are presently unavailable. Israel has conducted a series of aerial attacks in Sudan using warplanes escorted by long-range UAVs (Unmanned Aerial Vehicles). The attacks occurred during the dawn hours of Wednesday, 6th May 2015. The UAVs used their inbuilt night vision capabilities to precisely mark the targets thus ensuring that the missiles fired from the warplanes homed in on their targets. The attacks were aimed at a targeted convoy ferrying military hardware; and, a weapons facility in Omdurman. The convoy was struck by missiles as it traversed Omdurman. ISIS is about to overrun Baiji oil refinery – the largest oil refinery in Iraq. The Iraqi government sent reinforcements - Iraqi national troops together with Jund al-Imam militants - on 4th May 2015 but they have been unable to reverse the gains made by ISIS. Turkey is facilitating the actualization of Islamist's objectives in Syria. The Turkish Government is working alongside KSA (Kingdom of Saudi Arabia) to aid Jaish al-Islam and Ahrar al-Sham Salafist rebel groups. The recent rebel victories have been achieved chiefly due to prudent strategic planning with military operations being planned months ahead of their commencement; with ancillary offensives being conducted prior to the main offensive in order to secure strategic initiatives against the Regime. The Idlib offensive was preceded by the capture of Al Hamadiyeh and Wadi al-Deif military barracks in late 2014, thus enabling the rebels to stabilize the Idlib battlefront as well as weaken government forces in the region. Syrian Rebels have achieved a string of victories in the North of the fragmented nation by gaining large swathes of territories in both Idlib and Deraa Governorates. This presented a psychological victory for the rebels as the Syrian Government contends with disabling manpower losses and stark shortages of armed personnel. Pro-regime supporters have been expressing dissatisfaction with the way the government is handling the crisis by holding protests across the streets of cities under Regime control, as rebels attack pockets of Alawite villages along the Syrian Coast. Al Shabaab (officially known as Harakat al-Shabaab al-Mujahideen [HSM]) is the formal affiliate of al Qaeda which is currently conducting a prolific terrorist campaign against Kenya despite suffering a series of major strategic setbacks in Somalia - its home base and operational headquarters. Nonetheless, its activities threaten to destabilize the Horn of Africa region. The lethal and persistent terrorist campaign conducted against Kenya includes several high-profile attacks such as the 2013 Westgate Mall Attack which killed over 65 people, the June 2014 Lamu attacks which killed over 60 civilians, the 2014 Mandera attacks which killed 64 civilians; and the recent Garissa University College attack which killed over 147 people. To understand the actions of al Shabaab, one must understand al Shabaab itself. To defeat al Shabaab, one must identify and understand its ideology and thereafter proceed to defeat its ideology. Prior to identifying its ideology, one must identify its ideologues and reconcile their ideas with official statements made by the jihadist group (this topic will be discussed in another post). From the ideology emanates the strategic objectives of the jihadist organization, which serves to guide its operational aims and the selection of combat tactics to be used to achieve specified operational aims. 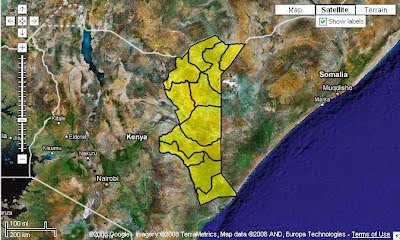 Somali-Dominated Regions in Kenya. Photo Credit: Google Imagery and Europa Technologies.